AncestorPuzzles.com: Thomas Clark- Kentucky Patriot or Early Sheriff? Would you rather have a Revolutionary War veteran for an ancestor or one of the first sheriffs of Fayette County, Kentucky? This is the dilemma I have encountered when researching the maternal grandfather of Jacob Coffman, Thomas Clark. I am still hoping that Thomas Clark might be both a patriot and a sheriff. Several of the Vance descendants applied to be members of both the Daughters and the Sons of the American Revolution (DAR and SAR). The DAR has established a great service to genealogists by creating a patriot database on their website. We are also fortunate that Ancestry.com has digitized applications of the SAR. Based on the application materials submitted to both DAR and SAR it appears that the Vance descendants where told that the father of Elizabeth Coffman Veach was Thomas Clark and that he was a veteran of the Revolutionary War. 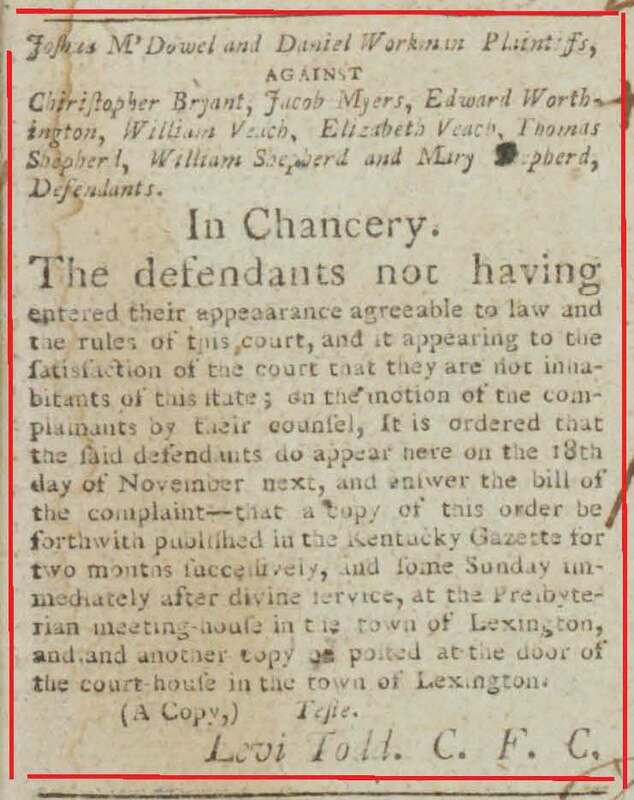 I am hoping that the living Vance descendants may have further information in their family archives to help me sort out this mystery but in the meantime I have been busy researching a vast array of documents related to the early history of Kentucky. When you look at the image above from the DAR Ancestor Rolls you see the warning in red letters that "FUTURE APPLICANTS MUST PROVE CORRECT SERVICE." Apparently the DAR has noticed a mistake in their records. It appears that the Vance descendants may have latched onto the wrong Thomas Clarke. There have been at least eight women who have entered the DAR based on genealogical research that was apparently faulty. Elizabeth Veach and her husband, William Veach are being sued by Joshua M'Dowell and Daniel Workman in September of 1797. The other defendants are Christopher Bryant, Jacob Myers, Edward Worthington, Thomas Shepherd, William Shepherd and Mary Shepherd. Several months later in March of 1798 we see that Thomas Clarke who is presumably the son of Thomas Clarke, Sr. has been named as an additional defendant but Thomas Shepherd is no longer named. The defendants are described as the heirs and representatives of Thomas Clark, deceased. The public notice further states that "it is ordered that Sarah, Roanna and Elizabeth Shepherd, daughters of Sarah and William Shepherd, late Sarah Clarke, be made defendants and Levi Todd, the clerk of this court is appointed guardian to the said Elizabeth who is under the age of twenty one years..." However, if you look at the previous notice it appears that the wife of William Shepherd was Mary Shepherd. The recommended course of action when you have a court case like this is to get copies of the complete file. However, there was a fire at the courthouse in Lexington in 1803 which destroyed everything recorded prior to that date. Despite the best efforts of the Kentucky Department of Library and Archives, there was nothing more to be found on this case. However, these newspaper articles present a much more complete picture of the descendants of Thomas Clark. I still question some of the details provided by the Vance descendants and much more work remains to be done to verify all of the following information. It is also clear that Thomas Clark must have died before September 1797 when this court case was first mentioned in the Kentucky Gazette. History of Lexington, Kentucky : its early annals and recent progress including biographical sketches and personal reminiscences of the pioneer settlers, notices of prominent citizens, etc., etc. Physical: 443 p. : front. Reprint. Originally published: Cincinnati : Robert Clarke, 1872. Page 71- The justices of the county court were successively sheriffs of the county until the law was changed in 1792. The first sheriff under the succession rule was Charles Carr. Mr. Carr was a native of Virginia, and emigrated to this state when he was but ten years of age. He was a private soldier in the American army, under General Anthony Wayne, in 1794, and took an active part in his celebrated campaign against the Indians. In the war of 1812 he served as captain, and was at one time a prisoner. Subsequently he was a member of the state legislature. He died in Fayette county, at an advaneed age. His successors as sheriffs were THOMAS CLARKE, J. 0. Richardson, Leonard Young, A. Young, James Wood, W. R. Morton, Edward Payne, John Bradford, G. W. Morton, Waller Bullock, A. Thomson, Oliver Keene, T. S. Redd, R. S. Todd, T. A. Russell, M. Flournoy, J. R. Sloan, Moses Ellis, J. B. O’Bannon, aller Rhodes, Abraham Dudley, Joseph Gross, C. S. Bodley, Thomas Nichols, W. W. Dowden, R.S. Bullock. Thomas Clark may have also served as a jailer but unfortunately we may never know for sure since the first name of Mr. Clark is not given. Page 164- The following is an incomplete list of those who have filled the office of jailer, viz: Innis B. Brent, --- CLARK, Barker, Wm. Bobbs, Nathaniel Prentiss, Richard Sharp, Joseph R. Megowan, T. B. Megowan, --- White, Ben. Blincoe, W. H. Lusby, and Thos. B. Megowan. Including all the terms he has served, Mr. T. B. Megowan has been a jailer for nearly forty years. If this date is accurate and the information from the History of Lexington is also accurate that the law was changed in 1792, it is possible that Thomas Clarke was actually the first sheriff of Fayette County. The caveat as always is that this is a work in progress. This is the genealogical conclusion based on the available evidence but hopefully there is more evidence to be found. UPDATE: The following is additional evidence that Thomas Clarke served as sheriff of Fayette County. 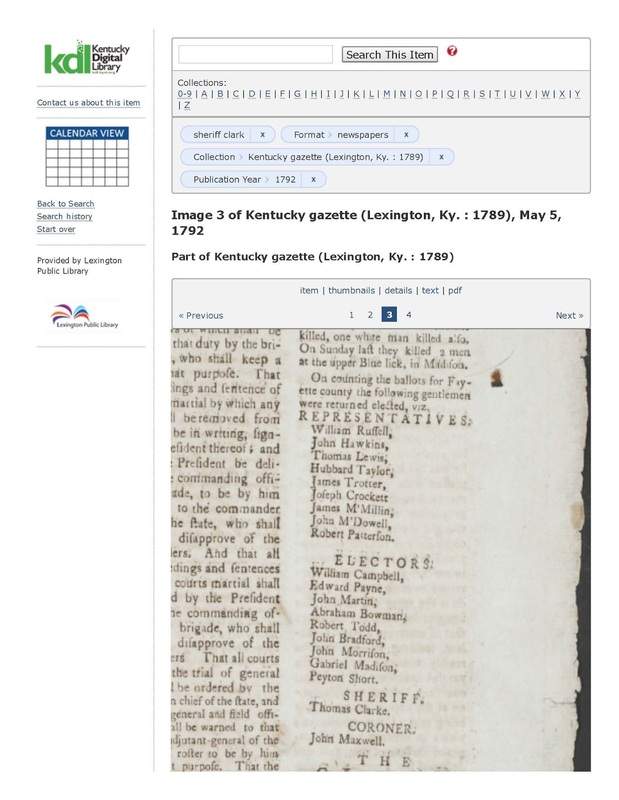 "Kentucky Probate Records, 1727-1990," database with images, FamilySearch; Mixed records, 1789-1798, Vol. 3, page 104 (https://familysearch.org/ark:/61903/3:1:3QS7-99DP-K9PX?cc=1875188&wc=37R1-BZQ%3A173385301%2C1561683468 : 27 March 2015), Fayette > image 59 of 438; county courthouses, Kentucky.